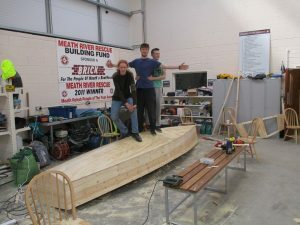 DO YOU AND A FEW FRIENDS, AS A SCHOOL OR A GROUP FEEL LIKE BUILDING A BOAT FOR A CHALLENGE SO YOU CAN ENJOY USING IT OUT ON THE WATER WHEN COMPLETED ? AT BEST A MINIMUM OF FOUR PEOPLE ARE NEEDED TO COMPLETE A PROJECT IN THE ESTIMATED TIME ( USUALLY ONE WEEK OR SIX FULL WORKING DAYS). 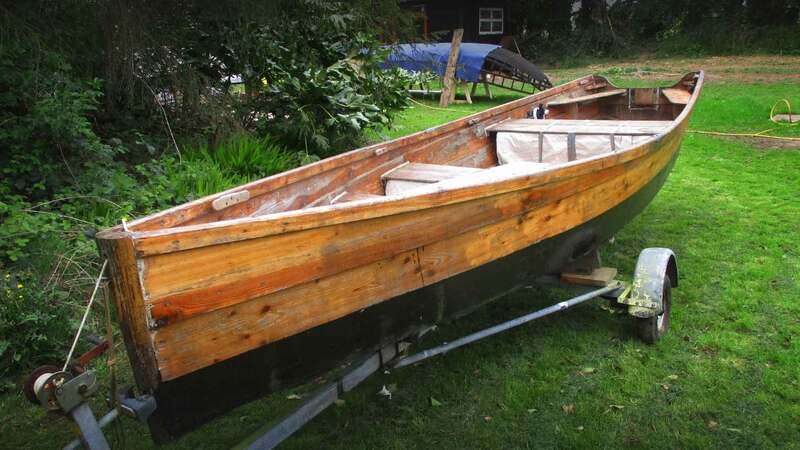 MY CHARGES ARE € 180.00 PER DAY ( PLUS A LOCAL ACCOMODATION OR B&B IF THIS IS NEEDED WHEN THE VENUE IS TOO FAR FOR ME TO COMMUTE ON A DAILY BASIS ) MATERIALS ARE NOT INCLUDED .BY THE WAY, IT ‘S AS EASY TO WORK WITH EIGHT PERSONS AND BUILD TWO BOATS SIMULTANEOUSLY THAN WITH FOUR . THE INSTRUCTIONS AND DEMOS TAKE JUST AS LONG . I HAVE PLENTY OF EXPERIENCE IN TEACHING ADULTS AND CHILDREN. GARDA VETTING WILL BE DONE ON REQUEST . THE RELATED CD AND MANUAL ACCOMPANYING THE PROJECT CAN BE RE/USED AFTERWARDS TO BUILD MORE OF THE SAME CRAFT AT NO EXTRA COST OR ROYALTIES . 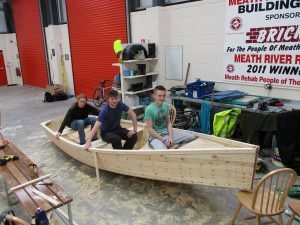 A FEW PICS OF SUCH A PROJECT AT ST PATRICKS CLASSICAL SCHOOL IN NAVAN , DONE BY 5TH YEAR’S AS A FUNDRAISER.IN THIS INSTANCE THE MATERIALS FOR TWO 16 FT BOATS WERE SPONSORED BY A LOCAL BUILDING SUPPLIERS. 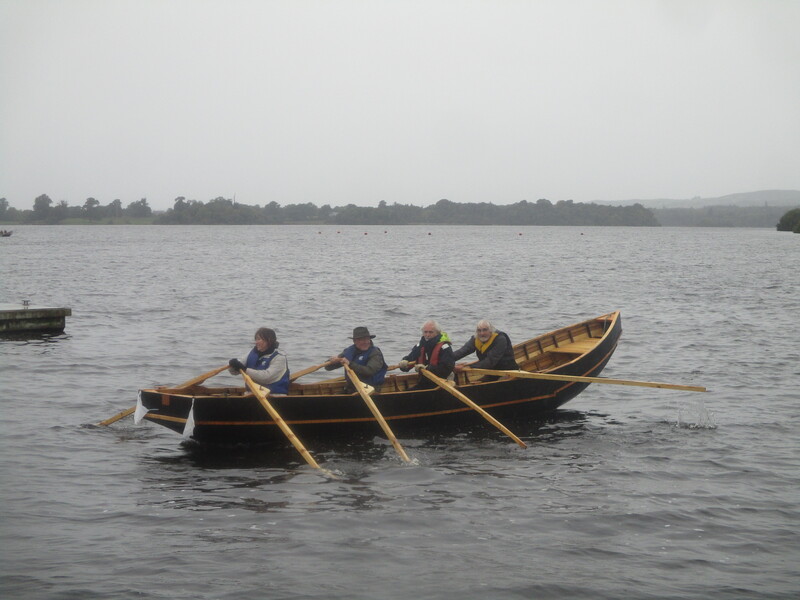 OR HOW ABOUT BUILDING THIS 25 FT CURRAGH ! 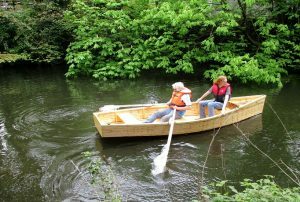 THE PLANS , TEXT AND MORE THAN 100 PICTURES AND VIDEOS SHOWING A STEP BY STEP PROCESS TO MAKE THIS BOAT ARE AVAILABLE ON CD . COST € 26.00 PLUS POSTAGE . 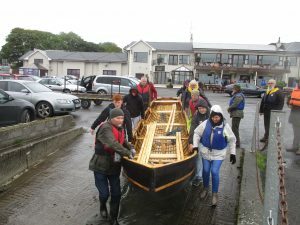 THE DESIGN IS BASED ON THE KERRY NAOMHOG , A TRADITIONAL WORKING BOAT ALONG THE KERRY COAST.